Khloe Kardashian thinks her brother Rob is ”trapped” in his body. The 33-year-old star – who is expecting her first child with boyfriend Tristan Thompson – has been helping a couple achieve different health goals on the season finale of ‘Revenge Body’, and while meeting the couple, she related their problems to her younger sibling, who has battled with fluctuating weight and even developed diabetes after his size ballooned. Khloe said: ”I know how you feel. Khloe also spoke of how her younger half-sibling Kendall Jenner was bodyshamed for her slender frame but she doesn’t think people ”sympathise” as much with victims who are too thin. Khloe said: ”I think people don’t sympathise when people are body shamed for being too thin. ”My sister Kendall, when she was growing up, she was very skinny and she used to get bullied all the time for being too skinny. 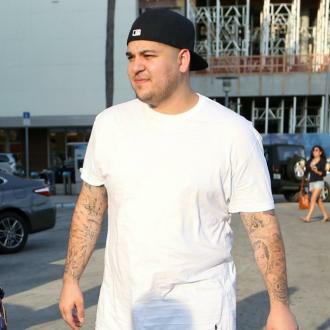 Rob’s weight has fluctuated over the years and he has reportedly reached 300lbs since he and 29-year-old model Blac Chyna – who is the mother of his 14-month-old daughter Dream – split last year, and friends are concerned about his health. The 30-year-old sock designer – who was diagnosed with diabetes in 2015 after he piled on the pounds – has reportedly been binge-eating on fast food and candy and gulping down cans of soda. He was hospitalised for a few days in December 2016, where he was treated for complications related to his Type 2 Diabetes.